Report Finds Global Banks Poured $1.9 Trillion into Fossil Fuel Financing Since the Paris Agreement was Signed, with Financing on the Rise Each Year. SAN FRANCISCO, March 20, 2019 — A report released today by Rainforest Action Network, BankTrack, Indigenous Environmental Network, Oil Change International, Sierra Club, and Honor the Earth, endorsed by over 170 organizations around the world, reveals that 33 global banks have provided almost $2 trillion to fossil fuel companies since the adoption of the Paris climate accord at the end of 2015. The amount of financing has risen in each of the past two years. Of this $1.9 trillion total, $600 billion went to 100 top companies aggressively expanding fossil fuels. Alarmingly, these findings reveal that the business practices of the world’s major banks continue to be aligned with climate disaster and stand in sharp contrast to the IPCC special report on global warming of 1.5°C, which highlights the need for a rapid phase-out of fossil fuels and estimates that the world's clean energy investment needs are $2.4 trillion per year up to 2035. Banking on Climate Change 2019 is the tenth annual fossil fuel report card and the first ever analysis of funding from the world’s major banks for the fossil fuels sector as a whole. 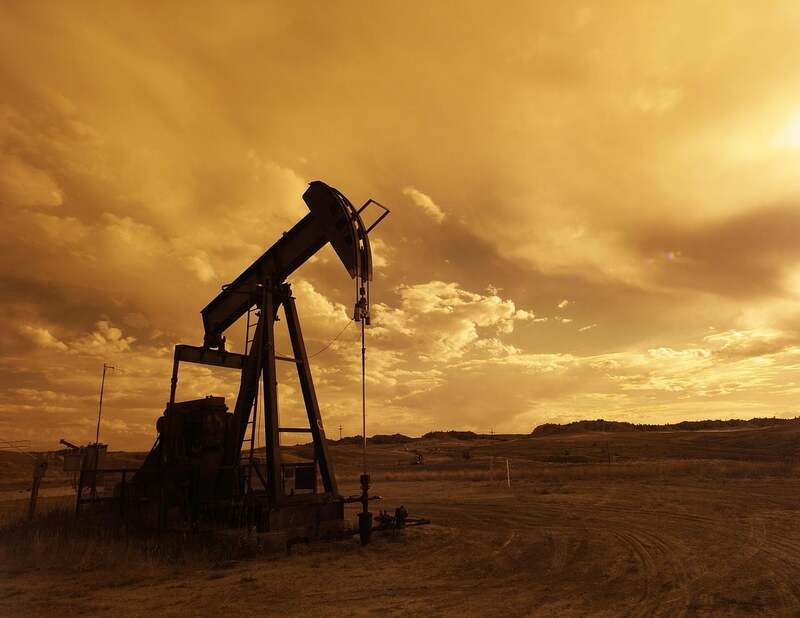 Expanded in scope, the report adds up lending and underwriting to 1,800 companies across the coal, oil and gas sectors globally over the past three years. The report also tracks fossil fuel expansion by aggregating data on which banks are financing 100 top companies expanding fossil fuels. Banking on Climate Change 2019 reveals that fossil fuel financing is dominated by the big U.S. banks: the four biggest global bankers of fossil fuels are JPMorgan Chase, Wells Fargo, Citi, and Bank of America. Notably, JPMorgan Chase is by far the worst banker of fossil fuels and fossil fuel expansion — and therefore the world’s worst banker of climate change. Since the Paris Agreement, JPMorgan Chase has provided $196 billion in finance for fossil fuels, 10% of all fossil fuel finance from the 33 major global banks. JPMorgan’s volume of finance for fossil fuels 2016-2018 is a shocking 29% higher than the second placed bank, Wells Fargo. The bank stands out even more from its peers in its volume of financing for the main companies expanding fossil fuel extraction and infrastructure: since Paris, JPMorgan Chase’s $67 billion in finance for the expanders is fully 68% higher than that from Citi, in distant second place. 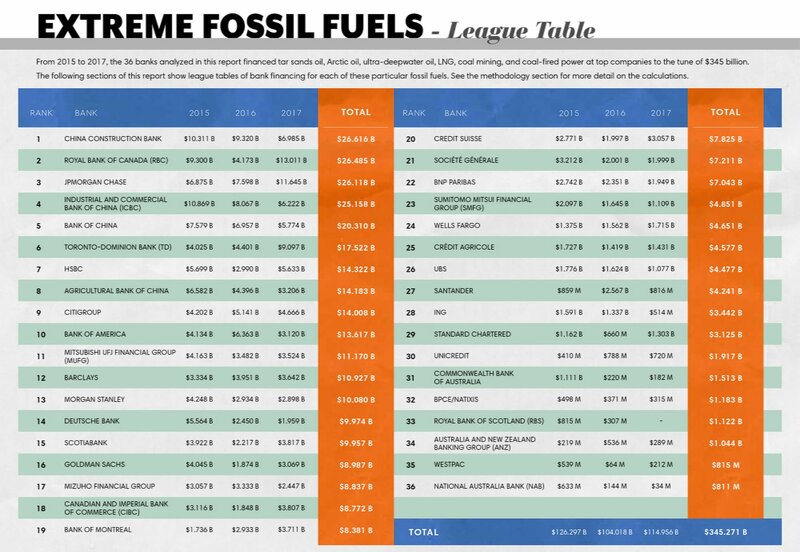 With Morgan Stanley and Goldman Sachs in 11th and 12th places respectively in the fossil fuel financing league table, all of the big six U.S. banking giants are in the top dirty dozen bankers of climate change. Together, they account for 37% of global fossil fuel financing since the Paris Agreement was adopted. U.S. banks also emerge as the biggest bankers of fossil fuel expansion. The report also grades banks' future-facing policies regarding specific fossil fuel sectors and fossil fuels overall. Assessed against restrictions on financing for fossil fuel expansion –– no banks scored above a C-range grade, and most bank grades were in the D range. No banks have made commitments to phase-out fossil fuel financing in alignment with a 1.5°C-aligned Paris-compliant trajectory despite the fact that numerous banks and bankers — including JPMorgan Chase CEO Jamie Dimon — have declared their support for the Paris Agreement. The report also analyses the banks’ unacceptably poor performance on human and Indigenous rights as it relates to the impacts of specific projects, and climate change in general. The case studies detailed in the report — from the X project, to the Y project, to the Z project — all highlight that banks lack effective energy and human rights policies to prevent them from financing these highly problematic projects and the companies behind them.